Airport body scanners that use X-ray technology have been banned in the European Union. In a press release regarding the machines, officials have deemed X-ray technology off limits in order to not risk jeopardizing citizens’ health and safety. X-rays emit a tiny amount of radiation and have long since been linked to causing cancer in rare instances by physically damaging DNA. In a letter to ProPublica from the FDA, the agency claims that the risk of fatal cancer from scanners is 1 in 400 million. A piece by ProPublica earlier this month indicated that anywhere from six to 100 US airline passengers could develop cancer each year from using the machines. The TSA has responded to the EU’s decision to discontinue use of X-ray scanners, revealing that more than 300 dangerous or illegal items have been found on passengers using these scanners. That debate aside, the EU has banned the machines in favor of other scanner types that do not use X-ray technology. The replacements will use millimeter wave tech which uses low-frequency radio waves thought to be less dangerous. As of now, airports in the US will continue to use both types of scanners. Around 250 X-ray machines are currently deployed in the US, alongside 264 millimeter wave body scanners. 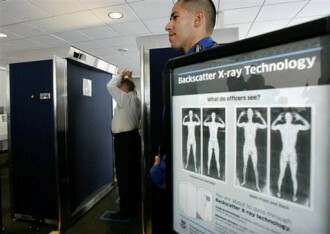 Body scanners in general have been criticized since their deployment based on privacy concerns. The scanners can essentially see under clothing, revealing hidden objects like explosives that a metal detector wouldn’t pick up as well as an intimate look at one’s body. Of course, one can opt out of a body scan and receive a pat down by a TSA official.